I should have blogged this week. I kept meaning too. But it was always that or sleep, and sleep always won. 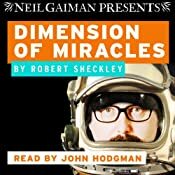 The first thing is, John Hodgman's recording of the audiobook of Robert Sheckley's DIMENSION OF MIRACLES is coming out from Audible on the 26th. 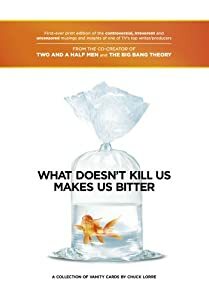 It was recorded a while ago, and it's been my favourite audiobook since I first heard it, 14 months ago, but it's been delayed because once Audible heard it they got all excited too, and have been waiting for the right time and the right way to release it in order to make a fuss about it. It's been one of my favourite books for years, and I remember Douglas Adams telling me how shaken he was to read Dimension of Miracles and watch someone doing something a lot like the Hitchhiker's Guide to the Galaxy a decade before he did. Hodgman's narration is very dry and very funny, and the content is brilliant. With audiobook narration, there are certain voices that fit perfectly with a genre. John Hodgman may now be the go-to guy for the droll-everyman-navigating-his-way-through-the-universe story.... Hand-picked by Neil Gaiman (whose charming audio introduction perfectly sets the stage for what’s to come) Hodgman lends the right amount of nerd-cred to this adventure, which was originally published in 1968 and is a clear forerunner to Douglas Adams’ classic The Hitchhiker’s Guide to the Galaxy. I’ve had a chance to hear an advance excerpt of the audio, and I just have to know how Carmody, the unsuspecting winner of a Galactic Lottery, makes his way back to Earth in one piece. To promote it, Audible are doing a sweepstake, to send someone and their person to the New York Comic Con: www.audible.com/ComicCon_NYCTrip is the link. www.audible.com/ComicCon_NYCTrip_FAQ is the link to the FAQs about the sweepstake. Mostly they want to draw attention to the book, to what John Hodgman is doing and to get the world to listen. I am delighted. It's amazing. NEXT: Please watch, and share, this very short video. It's the most beautiful of all the BlackBerry Keep Moving videos: it was filmed last week, in Cambridge and London. I look a lot like I'd flown from LA to the UK and had not got enough sleep at any point on my travels, but I also look like I am having an amazing time. And I was. I flew in to South By SouthWest in Austin, Texas. I was in conversation with Chuck Lorre, and it was ridiculously fun. (Here's a write-up.) I liked him a lot: in an alternate world in which I'd decided to make American sitcoms instead of making everything-but-sitcoms, I suspect I would have wound up a lot like Chuck. The next day I went into the recording studio, Tequila Mockingbird, where recording engineer Shayna Brown and I huddled down in our little studio and I recorded THE OCEAN AT THE END OF THE LANE and then recorded SMOKE AND MIRRORS. I had memories of the Sussex accent that I used to hear as a boy, especially from the old local farmers, and had written some of the characters in the book with that accent, and then had a panic attack before we started. Had I imagined the accent? And why are the Sussex R's in my memory so much like West Country R's? What if I started going West Country? I appealed to Twitter, and people sent me links to http://www.bl.uk/learning/langlit/sounds/text-only/england/milland/, where I listened and also learned that the R in all these words would at one time have been a feature of speech across the UK and it remains very much a part of the English spoken in Scotland and Ireland. In present-day England, however, it is increasingly restricted to the West Country, the far South West and an area of Lancashire to the north of Manchester. Recording Ocean was hard and beautiful. Recording Smoke and Mirrors was alternately a joy and a nightmare -- there were so many accents and voices of so many kinds, and I did them all as best I could and cursed the long-ago-me who had thought it was a good idea to have characters in my short stories who did not speak exactly like me. Shayna was an absolute dream - just someone who makes it easy for you to do your best work - and I am so grateful to her and to Page, who made my life work. At one point Amanda decided it would be fun to put on a Ninja event for Austin people who did not have South by Southwest badges. She went onto Twitter, and that evening she had a full theatre, four bands and a documentary crew: she performed for them, and interviewed the bands and documentarians. It was remarkable. I loved it. 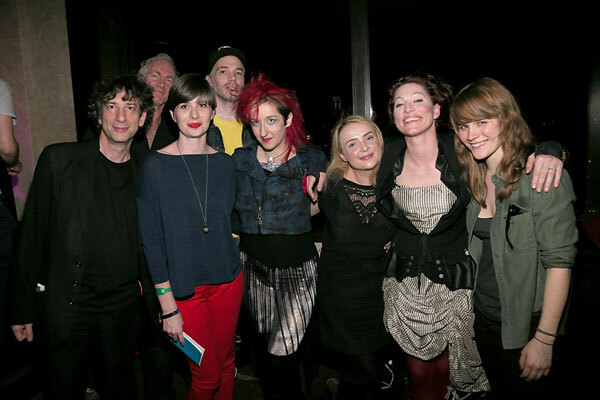 Actually, it is quite possible that my favourite moment of SXSW was Amanda and Billy Bragg. That was glorious -- they performed the folk song The World Turned Upside Down together, and then Amanda did the best of all Ukulele Anthems. Shayna and Page also had to cope with the arrival of Cat Mihos, who flew in from LA to work on the BlackBerry Keep Moving art with me. If you've been to the http://keepmoving.blackberry.com/desktop/en/us/ambassador/neil-gaiman.html site and looked at the art, you'll have seen, well, a lot of art. A lot of really good art. Over 5,200 pieces of really good art. I had to pick a shortlist, from which we will pick 20 pieces for each month to go on the upcoming CALENDAR OF TALES website. And because of various website-building schedules, I had to do it NOW. Cat had thought to make my life easier by drawing up her long list, but I had to explain to her that I couldn't do it like that: I wanted to see all of them. Everything that had come in. I'd do it again. So many amazing images. So many people creating as a group. It made me so happy. The morning I left Austin, Neverwhere suddenly became a trending topic on Twitter. The first part of the BBC Radio 4/ Radio 4 Extra series, starring Benedict Cumberbatch, James MaCavoy, Natalie Dormer and Bernard Cribbins and David Harewood and Anthony Stuart Head and lots of other people had been broadcast on Radio 4 in the UK. And not just because Benedict Cumberbatch sings in it. You can't use iPlayer on mobile platforms, but you can use apps like TuneIn Radio to listen, replay or record it. From March 22nd, you'll be able to download the first part as the BBC Weekly Drama podcast. The whole thing -- all 6 episodes -- will be available to be listened to until the 29th.